The La Quinta Inn & Suites San Antonio Medical Center has been awarded the 2016 TripAdvisor Certificate of Excellence award. Enjoy the upscale, state-of-the-art La Quinta Inn & Suites San Antonio Medical Center offering vibrant, inviting guest rooms with a San Antonio feel that include luxurious pillowtop beds and down comforters, refrigerator, microwave, granite countertops, and free wired and wireless Internet access. 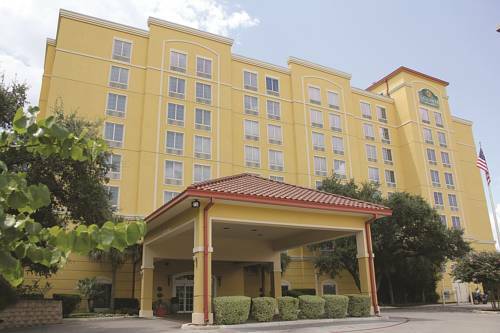 We're the closest hotel (only 1 mile) to the UTHSC Medical Center and hospitals, with Six Flags Fiesta Texas, La Cantera Shopping Mall, the Riverwalk, and the Alamo minutes away, and we are only 12 miles to SeaWorld! Take advantage of our Free Bright Side Breakfast featuring "make-your-own waffles", courtyard, outdoor pool, and spa (open year around). Additional amenities include a very spacious desk with speaker phone, computers, and printers in our business center, and Life Fitness equipment in our fitness center. This hotel is 100% non-smoking and pet free. We are now serving a bistro type menu daily from 5-9pm. The bistro offerings to include panini sandwiches, freshly made pizzas, sandwiches, soups, appetizers, and more! We have over 10,000 sq ft of available meeting space to accommodate from just a few guests meeting in our board room to an event for up to 600 people in our ballroom. With our proactive gracious service, this San Antonio hotel is an ideal choice for your next business meeting, event, wedding, or social gathering. All reservations must be cancelled BEFORE 6pm local hotel time on the scheduled date of arrival to avoid being charged one night's room rate plus all taxes. Exceptions may apply during Holidays and Special Events.